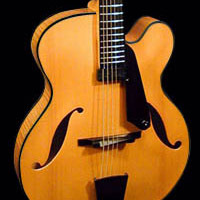 All of our archtop guitars are available in a variety of tints, colors, and bursts. All are X-braced, and feature a dual action truss rod for maximum control over deflection. 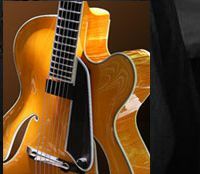 We currently offer our guitars in 16", 17", 18", and 19" Concert Grand widths, and 20" widths for our acoustic bass bodies. Venetian cutaways are standard, but may be made in the Florentine style, and we make our Florentine cutaway with an invisibly mitered corner, the same way we miter the corners on our violins and violas. Standard scale length is 25 1/2" for six and seven string guitars, and 34" for basses, but we can produce the fret coordinates, via computer, for any scale length you desire. Standard nut width is 1 3/4". Seven string nut is 2 1/16". 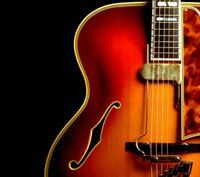 Fingerboards have 22 frets, unless otherwise specified, 24 frets on basses. uniform thickness, then we brace them in a manner that controls damping, and allows the top to vibrate very freely. The back is then graduated in "zones" of varying thickness, and acts as a diaphragm, or as Sacconi put it, the "lungs" of the instrument. We've designed our bracing system with a very thin profile, and deep scallops, which allows more tension to be supported with less mass, and less contact with the plate's surface area, allowing the top more freedom to vibrate. Our neck construction employs tried and true principles, as well as some innovations that dramatically improve playability and tone. We start with a three piece foundation of hard maple, separated by two thin strips of black hardwood. This five ply construction provides great rigidity and strength. We then install a dual action, stainless steel truss rod for maximum control. The result of these innovations in carving, bracing, and construction are quickly and easily noticeable. An immediate response from the plucked string, rich harmonic texture, and more acoustical volume than ever before.